Orsu Metals Corporation (TSX-V: OSU) (“Orsu” or the “Company” http://www.commodity-tv.net/c/search_adv/?v=298573) is pleased to announce additional metallurgical test results on a primary sulfide sample (WK18-1) from Klyuchi West prospect at the Sergeevskoe Gold Project in Russia. Positive cyanidation test results for oxide samples from Adit 5 (85.17% to 95.3% recovery) and Kozie (91.72% to 92.32%) prospects were announced on March 12, 2018. The 2018 drill holes and trenches were completed within a 1 sq km area in the southeast of the Sergeevskoe license at Zone 23, Adit 5, Klyuchi West and Kozie prospects, with scout holes drilled at the Sergeeva and Peak Klyuchi prospects. - Sample WK18, grading 1.4 g/t Au, showed an 85.8% recovery of gold using the gravity-flotation scheme with cyanidation. - A total 89% of gold can be recovered after additional cyanidation of crushed gravity cakes. 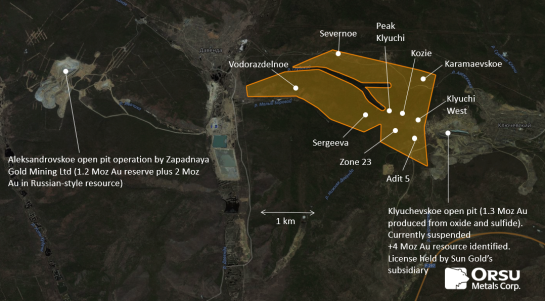 The license of the Sergeevskoe Gold Project occurs immediately east from the Aleksandrovskoe open pit and gold plant owned by Zapadnaya Gold Mining Ltd and to the west from the Klyuchevskoe gold license owned by Sun Gold Mining (Figure 1). The Klyuchevskoe (Klyuchi) gold deposit represents a +6 Moz gold endowment (see Orsu press-release dated September 21, 2016). Orsu owns a 90% interest in the Sergeevskoe Gold Project (see press release December 1, 2017). As part of its 2018 exploration works, Orsu collected sample WK18-1, consisting of visually unoxidized rock fragments, 100 mm in size and smaller. The intrusive rocks contain chaotically-oriented veinlets in voluminous gold-mineralized stockwork at the Klyuchi West prospect (see press release August 8, 2018). The tests included studies of chemical and physical properties, gravity and flotation beneficiation, as well as bottle roll cyanidation of gravity, flotation and gravity-flotation concentrates. The study was conducted at the Irgiredmet Institute (“Irgiredmet”) in Irkutsk, Russia, which is specialized in conducting the metallurgy tests and is independent from Orsu. Sample WK18-1 (175.7 kg) was collected from drillcore of four holes, drilled at Klyuchi West (Fig. 1) as part of the 2018 exploration program. Mineralogical analysis identified that rocks consist of hydrothermally altered granite with numerous quartz-tourmaline veinlets with minor (0.8%) sulphides, mostly pyrite and rare chalcopyrite and arsenopyrite. Mineralogical analysis identified free gold (32%), with 95.9% of gold in <0.1-millimetre (“mm”) fraction (Figure 2). Irgiredmet assayed 1.4 g/t Au, with 0.352% Stotal, 0.35% Ssulfidic, 0.42% Ctotal, 0.017% As, 0.0074% Sb and <1 g/t Ag, indicating absence of detrimental elements. The oxidation state of sample is 38%. Microanalysis of gold grains revealed 87.6–93.7% Au and 7.3–12.4% Ag. Mineralogical analysis estimated 84.8% of gold in amenable to cyanidation form. In sample WK18-1, Irgiredmet measured a specific gravity of 2.67 t/m3. The measured Bond index (Ð’Wi) is 18.6 kWt*h/t. Figure 2. 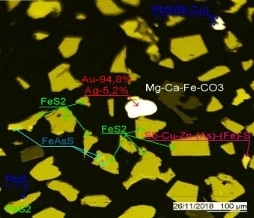 <0.1 mm gold grain present with pyrite (FeS2), arsenopyrite (FeAsS), galena (PbS), with minor sulfosalt (Sb-Cu-Zn-(As)-(Fe)-S) in gravity concentrate (-1.6 + 0.1 mm). Polyshed section in secondary electrons, Camebax SX-50, Irgiredmet. GRG-test of WK18-1 sample using Knelson KC-MD-3 concentrator recovered 52.9% of gold, with 1.06% yield of gravity concentrate grading 83.9 g/t Au. The flotation study of gravity tailings produced a 69.8% recovery of gold into a 16.1 g/t Au concentrate (3.1% yield) and 0.19 g/t Au in tailings. Flotation tests of WK18-1 sample were conducted on 95% grinding to -0.071 mm class, with 79.6% of gold recovered into flotation concentrate (with 6.9% yield), grading 14.5 g/t Au. The 65% grinding to -0.071 mm class demonstrated a 78% of gold recovered into flotation concentrate (with 5.8% yield), grading 17.8 g/t Au. In both cases, the concentration of gold in flotation tailings is 0.24 g/t. This demonstrates that gold recovery is not critically dependent on the quality of grinding. Direct cyanidation of WK18-1 sample demonstrated an 80% recovery of gold during 24 hours. Cyanidation of the specially prepared gravity concentrate, grading 63 g/t Au, recovered 82.6 to 85.7% of gold during 24 hours. Additional cyanidation of crushed gravity cakes resultÑƒÐ² in a total of 89% recovery of gold. Cyanidation of the 0.8 g/t Au gravity tailings recovered 78.2% of gold, with 0.19 g/t Au remaining in tailings. Cyanidation of the specially prepared flotation concentrate, grading 18 g/t Au, recovered 79.82 to 80.65% of gold during 24 hours, with 0.19 g/t Au reporting into flotation tailings. The cyanidation of the tailings showed 66.7% recovery of gold. The study by Irgiredmet showed that 85.8% of gold can be recovered using the gravity-flotation scheme with cyanidation. Spamprotection Please add 19 and 3.